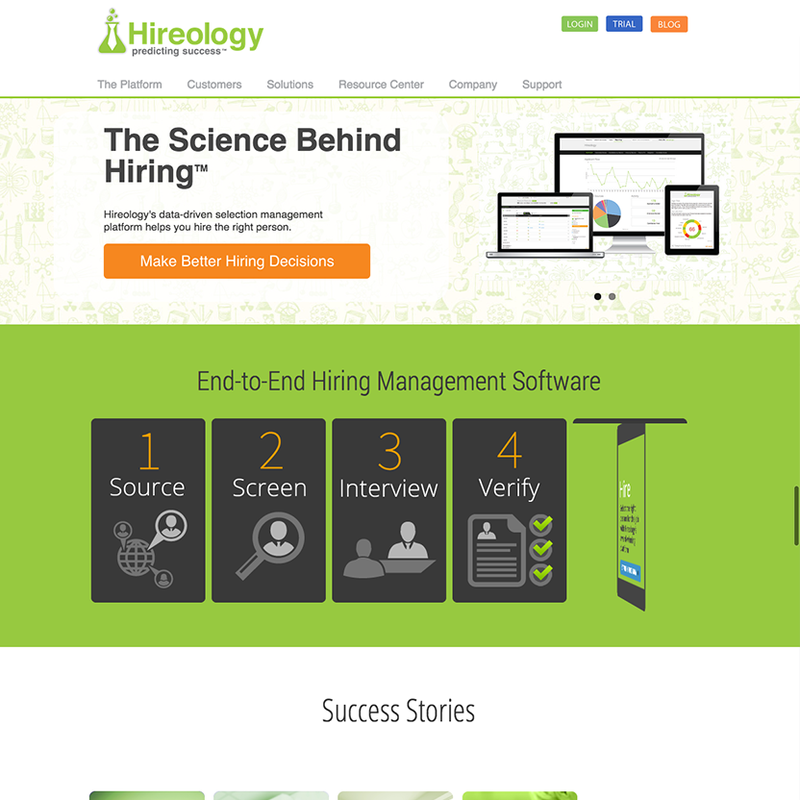 Hireology's new sales-ready website creates an online presence to increase conversions. 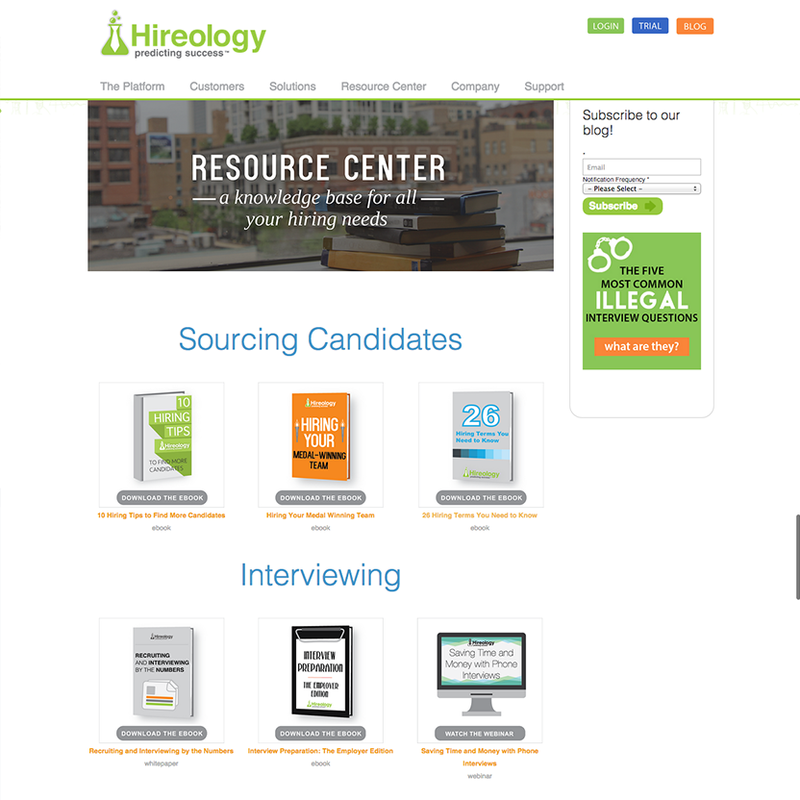 Hireology came to New Breed with the goal of increasing their lead generation efforts to help them meet their business goals and improve the user experience. The new site would also need to portray their brand position as a savvy and modern technology company in a way their old site was not. We kicked off our partnership with Hireology with our Digital Onboarding Workshop to define their buyer personas and determine website goals, strategy and planning to ensure that their business goals and the architecture and content of the new site would be in alignment. Next, we designed and developed a sales-ready website using HubSpot’s Content Optimization System. The site was designed to highlight their platform, and the success stories they have helped their customers achieve, a critical trust mark in the complex B2B buyers journey. We also highlighted their content library both on the homepage, Resource Center, and in the sidebar of their sub-pages to help them show contextually relevant content to their site visitors, increase lead generation, and more effectively nurture leads down the marketing funnel. To bolster this presentation, our development team also included a custom flip-functionality on end-to-end management section, which was non-native to the HubSpot COS to dynamically portray the power of their platform and their process. 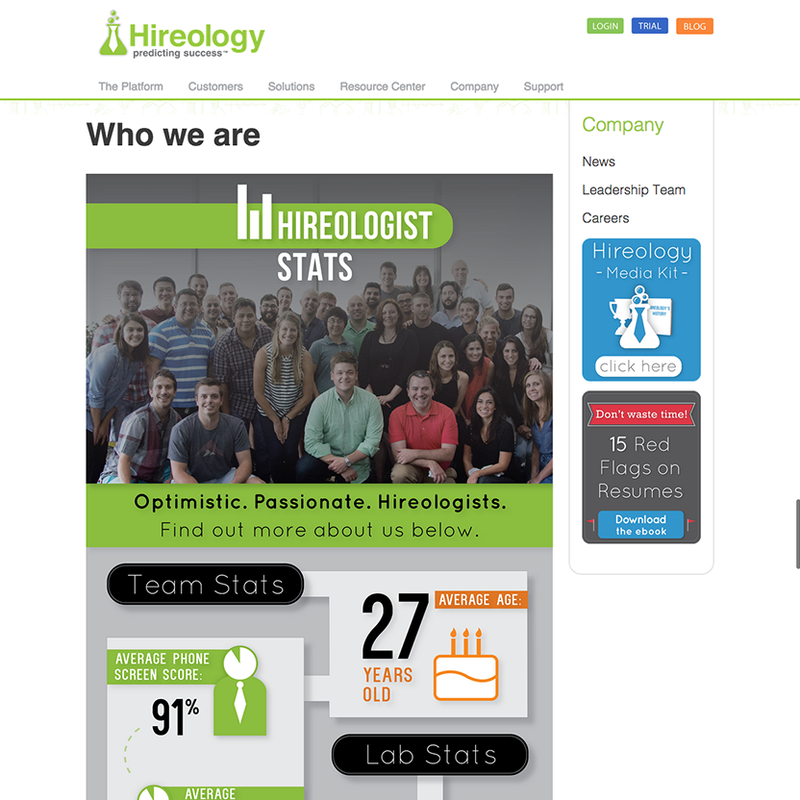 Since the launch of their new website, Hireology has seen an increase in their visitor-to-lead conversion rate. Their Resource Center now ranks in their top 5 conversion assist pages since the new site launched, and average session duration has increased 11%. 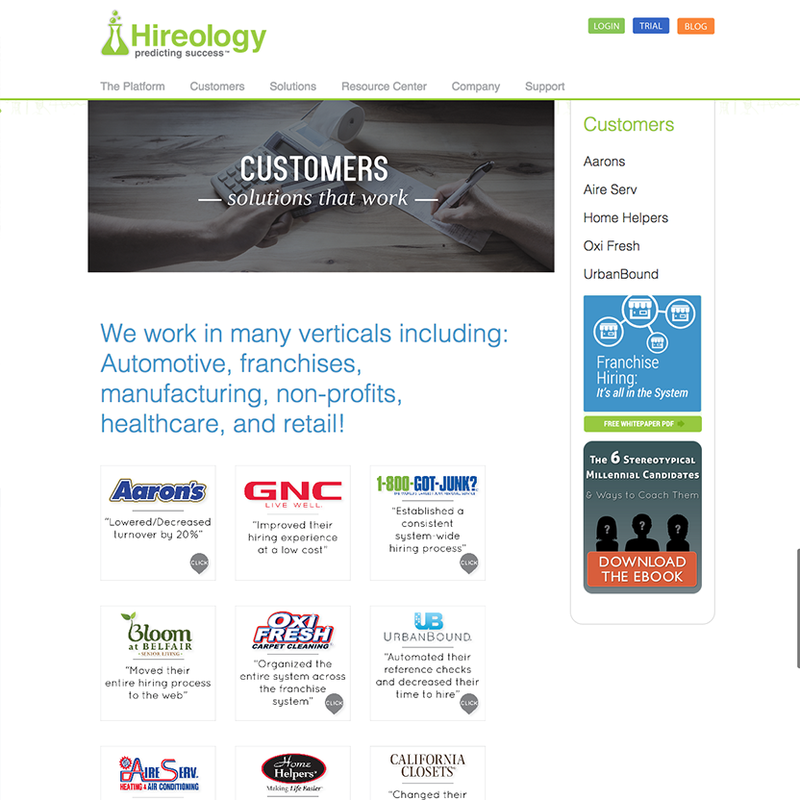 Hireology is a Chicago based software company that helps franchise owners, small business owners, recruiting consultants and Fortune 100 managers increase hiring efficiency and effectiveness. Their software helps their customers recognize qualified candidates in order to establish a consistent hiring process, while improving performance, employee morale and retention rates. Give us a call! Speak with one of our skilled Inbound Advisors who will answer any questions you might have about working with us. 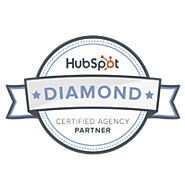 One of our Inbound Advisors will walk you through the steps your company can take to transform your current marketing + sales. Take your marketing + sales to the next level. Discover the power of Inbound Marketing. Take a test run of the software that gets you there.